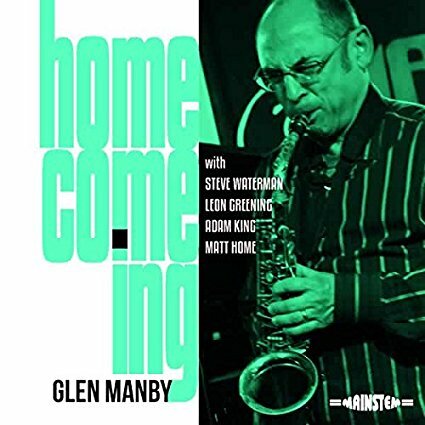 Great to hear this debut album from saxophonist Glen Manby, straight out of the hard bop top drawer and a real breath of fresh air to boot. A driving, hard swinging set with some memorable compositions from the leader along with some firecracker solos from the front line horns and pianist Leon Greening. The Cardiff based altoist was a familiar face on the Welsh jazz scene back in the late eighties when I was regular attendee of gigs in the Capital, and our paths regularly crossed. Since moving away from the Principality over 25 years ago I had lost touch with Glen and his music, so it was nice to receive a copy of this album for review and to catch up with his activities in the intervening years. Manby was always an interesting player with plenty of ideas, yet never one to be rushed or pressured into delivering any other way than in his own time, and this gave his solos a balanced and well judged feel. In time honoured tradition, Glen has since garnered plenty of playing experience leading his own bands and playing in the big band, The Collective, led by Paul Hornsby. He also furthered his studies with a scholarship in 1997 at the New School in New York and completed his M.A. in jazz at the Welsh College of Music and Drama. With these admirable credentials under his belt, his debut album seems to have been a long time coming, but one that has been worth the wait. Homecoming is a well balanced set of original compositions, with a few standards thrown in for good measure, and if the saxophonist sounds a little tentative at first, by the time he hits Wayne Shorter's 'Yes Or No' he is considerably more assured, laying down the gauntlet and taking the first solo that is full of twists and turns, and interesting melodic ideas. Having hit his stride, Manby continues to deliver the goods. Citing his influences as Charlie Parker, Cannonball Adderley, Sonny Stitt and, Phil Woods among others, he sounds like none of them with his plangent alto sound spinning out his own stories in his solos. He tackles 'Us (Una Mas)' by Kenny Dorham with no little aplomb, and lays his heart on his sleeve on the quartet outing ,'Mayfly'. Having said this the real joy in the music is hearing Glen's original tunes, neatly arranged for quintet. Particularly effective are 'Heimweh' (meaning 'homesickness' in German) which brings to mind the Clifford Brown-Max Roach Quintet, the bossa nova 'Boss Bop Bossa' and my particular favourite, the upbeat 'Skippy' apparently titled as the composer forgot the original title when the time came to record the tune. No mishaps in the playing however, has Manby's lively piece brings out the joie de vie in all. If I have talked mainly about the saxophonist in this review, it is merely the pleasure in reaquainting myself with an old friend. It would however be doing all a disservice by not mentioning the superlative rhythm section who power things along in fine fashion, with pianist Leon Greening also contributing some fine solos. Steve Waterman throughout is a fine foil for the altoist, whether taking the first solo and setting the pace or picking up the thread after Greening or Manby, his playing is consistetly inventive. A fine set in the hard bop idiom that does not look back, but to the present and how to keep this exciting music moving forward. Thoroughly recommended.